This empty supermarket is waiting for a tenant. And sure enough, an enterprising company built a nicely laid out and attractive shopping center nearly 10 years ago and even called it “North Albany Village.” But Ray’s, the supermarket that anchored the center, turned out to be not a commercial success, and it closed last December. Whatever decisions residents had made about living in the vicinity because of that “village” were thrown for a loop, at least for now. These people used to have a short drive to the store, and a few could even reach it on foot. Now, if they want groceries, they cross the Willamette and drive across town. If they can’t combine this with other errands or going to work, it’s an extra trip. Talk about burning more gas. So far there’s no prospect of replacing the missing supermarket. I asked Pete Snook, a principal in the Portland-based Deacon Development Group, if he was close to signing somebody up. He told me he was getting calls from brokers, but “so far, no one has actually talked to me about something concrete … . We have given the package out to several grocers, and one or two said they would look at it, but no one has responded yet. I still expect it to be months and not weeks to find someone.” That was on Feb. 20, three days ago. Lisa Campbell responded on Facebook: Sadly the rent is so incredibly high there, that more businesses are trying (or already are, in the case of Subway) to relocate rather than locate there. Rays paid such a high rent…one has to wonder if that’s why they went under. Their prices were so high they certainly weren’t competitive. The poor economy doesn’t translate to out of town property owners. So, as local consumers, we will be stuck with empty buildings and no potential for immediate relief and the north Albany community is without even one grocery store of note. Given the fact that the bridges have been closed at least twice, during inclement weather, and north Albany was cut off from town proper…it would be nice for the residents if there was a store in the vicinity during future similar events. Hasso, have you thought of running for the city council? Your mentioning the real world made me think the city council needs you. 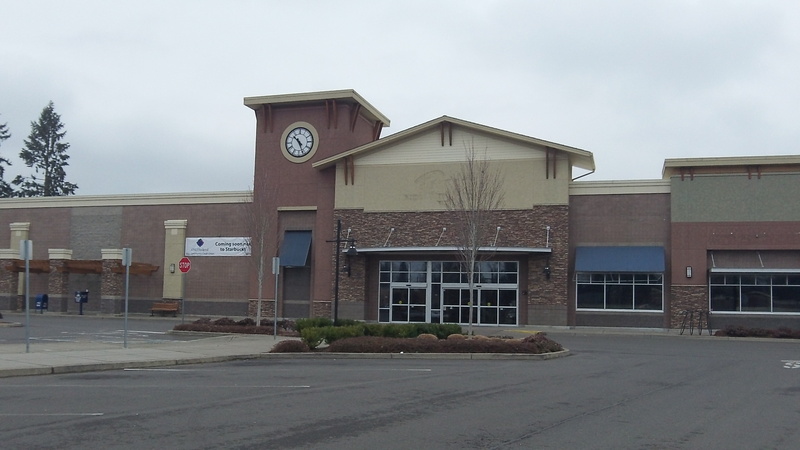 Speaking of grocery stores, Albertson’s in Albany is a goner, too. That will get blamed on Wal-Mart, but they were in bad shape before Wal-Mart was ever in Albany. I bought a box of Whitman’s chocolates at Albertson’s about 8 years ago and they were rancid. I think there are considerable preservatives in boxed chocolates, so they had had those a good while. That turned me off on Albany’s Albertson’s. Carolee Gascoigne also commented on Facebook: Grocery stores are hard to come by in Albany. Out by Linn-Benton College we have to travel as well to get to one nearby… So much for a “village”. I worked in the grocery industry for 23 years. Back in the 80’s our customer count could have been 4,000 a day !….so if you take 8,000 people living in N. Albany (how many households ?) and say they shop 1-2 times per week…..may not be enough people over there to support a store. Expenses to operate a store are very high and profit margins are low. Again, I think it is the overall economy that is causing these closures. Money is tight and many businesses that have been holding on and just cant any more. Ray’s market is undergoing a restructuring as a total company so they are closing a number of stores, not just in N. Albany. They are a high-end grocery store (and I personally really like them) but it appears the poor economy finally got them; just as it has so many other small businesses. Raising business taxes and passing more regulations making it difficult to do business will accelearate the loss of business in Oregon. If you like the economy we are mired in, vote Democrat this November – they own it. Jeff Turner also responded on Facebook: Being a N. Albany resident, one of the draws to this community was the fact that Ray’s was just 2 minutes from home. But, that convenience came with a cost. Ray’s prices were always higher than most any other store in Albany, so it became more cost effective to drive to another store to make larger purchases and go to Ray’s for last minute items. We have seen a number of food related businesses leave North Albany Village, presumably due to the cost of leasing there. Benton County has a considerably higher tax rate as well, so it makes surviving in this economy a real struggle. I love living in Albany but every time I go grocery shopping it makes me miss going to Zupans in Portland. This town is sadly lacking in high quality meat and vegetable options which is what 95% of my grocery shopping list consists of and that’s really sad considering how we are completely surrounded by farms who grow just that. Just once I would like to buy a potato and not have to wonder if it’s already rotten inside. Rays was just a more expensive Safeway with less selection and that’s why I never bothered to cross the river to go there. I would definitely drive there if a place like Zupans went in where I knew I would be paying a little more but would actually bring home fresh and local food and that makes me wonder how many other people would also be willing to do that. Let’s hope somebody at Zupan’s reads this.